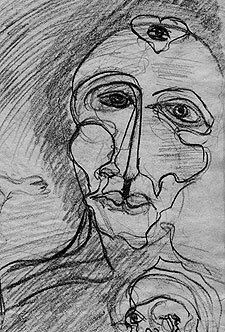 Joudry's drawings are reminiscent of Picasso. The sculpture and drawings of Hugh Joudry are featured at Gallery in the Woods (145 Main St., Brattleboro) during May and June in a show entitled "Voices in the Mountain: Visionary Art and Sculpture." He has been going about the business of sculpting for many years but staying under the radar, living more like a monk than a scion of the art world. He would not have it any other way. But it is also an exciting time for the artist. His work is getting attention from the "Outsider Art" movement and soon will be featured in Raw Vision magazine. The artist's journey started in 1968. While Joudry was working for the U.S. Forestry Service and camping was a way of life, a friend disappeared into the woods for several hours, bringing with him a chisel and mallet, and a small stump. He returned with a carved piece of wood. Joudry was so taken with the transformation that within a week he had obtained his own tools and began sculpting. He has not looked back. "I marveled that something 'could happen' using your time that way. And the great thing is that you do not know what will happen." Joudry chisels his way through each block of wood or marble to reveal its inner character. Joudry had prepared, though, for that epiphany in the woods. He'd been reading books on Taoism, Buddhism, books by Alan Watts, and Eastern and Western psychotherapy. At the time, theater was the framework. That all changed and, to hear him tell it, seemed almost predestined. "What I loved about sculpture, and fit with my attraction to Zen, was that there was nothing between me and the medium -- no assemblage, no waiting. It was the immediacy." During the summers, Joudry and his wife Jeanne live in a cabin on the Long Trail. He maintains both cabin and trail for the Forestry Service. 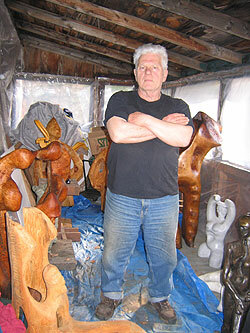 During the winters, they live in a rustic and rough-hewn house in Stratton, where his sculptures reside. The carved pieces, at various stages of completion, make a riveting sight, jostling one another for standing room, a gathering of beings made from the grandest and most long-living flora that rises up from the earth's floor, imbued now with particular form, movement, and spirit. Joudry is a mystic and a mathematician (in the winters he teaches math at the Mount Snow Academy), as well as an artist. This multitude of personas somehow fit into a short but stout frame, topped by a shock of white hair. Although he's in his seventies, and complains he can no longer move logs as he once could, he nevertheless moves massive hunks of wood into and around his studio. He happily accepts the logs that are left at his home. "People just bring me these great pieces of wood. A short time ago the Town of Stratton had to cut some elms. They brought me the logs ... I was thrilled because elmwood is the hardest of woods and lasts forever. Henry Moore used only elmwood." The winter months are for sculpting as summers are taken up with forestry work. There is the house's porch, but most of the sculpting takes place in a yurt just outside the door. Clear plastic over a wood frame keeps out the elements. He's kept warm, he says, by the heat created in just wielding the chisel and mallet against the hardwood. All the wood he uses is local, usually birch or maple. In fact, all his materials are indigenous. That includes the marble that he employed for three of the smaller pieces in the show: "The Bather," "Reclining Figure," and "The Eye." Vermont marble, he explained, is the hardest and whitest marble known to exist (Carrera marble from Italy is much softer and has a pink tone). Factoid: The Lincoln Memorial is made from Vermont marble. Vermont also has a gray marble, which Joudry used for "The Bather." He points out that marble is very expensive, and he wouldn't be able to use marble at all if it weren't for a fortuitous circumstance: his sister and brother-in-law own a farm in West Rutland, near the marble quarry, and chunks of marble are literally scattered about their property. Talk about the stars being aligned! When Joudry talks sculpture, he's just as likely to bring up the mathematics of the Golden Mean and Fibonacci harmonics as he is Brancusi. In fact, he has written a book on the subject of these mathematical and mystical equations. But, says Joudry, "for me, it is constricting to think too much about this -- in truth, as a sculptor, it is something I'd wish to arrive at intuitively. If you pre-calculate it, you're dead." Joudry's sculpture is far from dead! Dancing, lunging, striding, contorting, they inhabit their space with an assertive presence that seems as ancient as the shaman and modern as Giacometti. The "Great Cackler," with its undulating lines and mass of smoothed and glistening birch, seems to be lifting its head right off its shoulders, reminding me of "the trickster" that can be found in the myths of tribal cultures. "Horus," Joudry's sculptural interpretation of the falcon-headed god of ancient Egypt, looks totemic, but liberties are taken, especially with the lower half, an elongated spherical form with the middle carved out. These negative spaces, prevalent in many of Joudry's sculptures, he describes this way: "The holes serve as background to the resultant shape that forms around them, and there is a metaphysical reason too: that matter has the power to condense out of nothing except pure energy." For this reviewer, the "holes" create a dance with the space ... the pieces become ethereal, as if they are being formed before our eyes and can disappear just as easily. 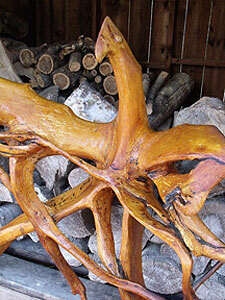 Important to Joudry's process is respecting the natural form of the wood. Two "Spirit Bird" pieces pretty much leave the roots from which they were made as found, though, says Joudry, "their mesh of interlocking tubular units suggests other correspondences with phenomena in the bird world." Pieces made from a birch tree often are striding figures, two- or tri-legged, because it is the nature of birch to have two or three thick splayed roots. Speaking again of the "Great Cackler," Joudry says, "It was while walking in the forest that I found this figure alighting from the air or from somewhere else. In the deep silence of the forest these things are amplified." He then adds, "I discovered later that such 'sightings' have been made by the ancient peoples who roamed the forest thousands of years ago. I feel I am in the lineage." He says he is especially fond of spirals in the wood, which many pieces take advantage of, such as "Wave," "Warrior," "Dancer," or "Liberation," the form wrapping around itself. He notes that the spiral has the added attraction of "a whole cosmology of rigorous mathematical thought behind it." It is also an ancient symbol of the goddess, continual change, the life journey, and evolution of the universe, showing up in Celtic, Native American, and Japanese art and culture, to name a few. Carl Jung calls it an archetypal symbol representing cosmic force. Among newer pieces, "The Witnesses" incorporates a subtle spiral. 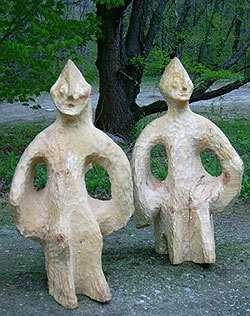 These sculptures express, says Joudry, "a connection I had with a timeless presence while hiking Glastenbury Mountain, a highly charged location with virtually no human habitation. It was during a lunch there that I made drawings of the presences that I felt and came back to my studio here in the Town of Stratton and set about carving them." In addition to the sculptures, selected drawings are being shown in the gallery. 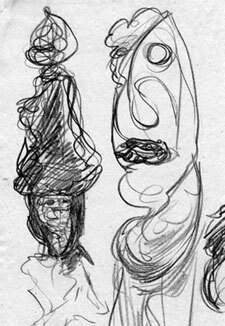 Joudry's drawings have elicited quite a bit of excitement recently, by, among others, the editor of Raw Vision. I am especially taken with the older black-and-white drawings. They have the muscularity and inventiveness of a Picasso and are possessed of a stark and haunting presence. The artist compares them to "automatic writing," writing that comes from the subconscious. But the newer ones, employing color, are intriguing for other reasons. Joudry says he is just "discovering color," and the drawings are giddy with it. These newer drawings sculpt the flat plane bit by bit, as if the repeated shapes were marks of a chisel. They surround an embedded figure, the background as alive as the page's protagonist. 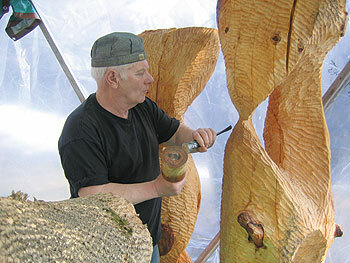 The artist works on them repeatedly, relating them to the sculptures he has in mind. 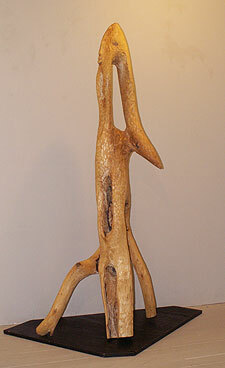 Straddling, like one of his long-legged sculptures, two worlds -- tribal-shamanic and modern -- Joudry's work does not fit easily into a "school" or gallery-ready label. And yet they are valued for their originality and power, a vision that is untainted, as some see it, by art-school training. This description of African sculpture well suits Joudry's ouevre: In these carvings there is no mistaking the energy and playfulness with which the human body is turned, by confident distortion, into such a gallery of wonderful creatures. It is a rare thing to have a show in town devoted to sculpture. Joudry's work is not in the mainstream of the current cultural take on sculpture, which in recent years has been all about installation. Installation art can be cold and antiseptic and intellectual. Not that I have anything against intellectual. But I think we are very thirsty for the human factor -- even bird-human, the fantastical human! These "wonderful creatures" say something about potential, about transformation, suffering and freedom. Joudry may not be in the mainstream, but clearly he swims comfortably in the ancient ocean of soulful human expression. For additional information and images of Joudry's work, please visit his website at www.hughjoudry.com.